"2048" puzzle game is the Flappy Bird of board games! SPOILER ALERT: Watch the video to see how customizable this 2048 source code is. Let your imagination go wild! The 2048 puzzle game is the new hot addictive game in the app store. Slide numbers across your screen to build a tile with the number 2048 by combining tiles. Don’t be late to the party, and come game this amazing app source code that’s built in Unity3d, which means your game is cross-platform, ready to be published for iPhones, iPads, Android phones and tablets. Life is good! Oh wait, you don’t know how to use Unity? No problem! We got you covered. When you buy this source code license, you get the full online video course on Udemy from super star app reskinning expert Yohann Taieb, for FREE. You can’t fail with this app code, every single steps are explained in details and shown to you, and Yohann is always here to help. The 2048 puzzle game is gaining so much popularity, you don’t want to be late to earn some $$$. If you’ve ever wanted to get your hands dirty and play with Unity, this is the opportunity and this source code bundle is for you. So don't stay on the sidelines and come ride the wave with us. 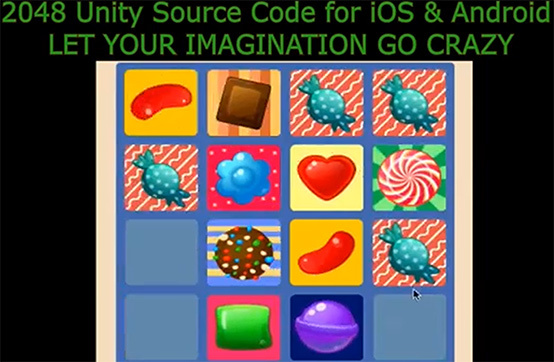 This mobile app source code is made with Unity3D for cross-platform deployment. It’s setup right out of the box to publish for all iPhones, iPads, Android phones and tablets. Now, you can go the extra mile and publish the game on Windows Phones, MAC OS, Playstation and Xbox, but we don’t support it. The image files are .png files, even the tiles, which means you can do more complex shapes, and even use other things than number. For example, check the video here, it's a candy crush 2048, not too shabby! iOS support on iOS 6.1+. Made for easy reskinning. All images are in png format, just 2 folders to change: icons, and board images. The online courses shows you how to play with the game graphics to make dozens of different games in no time. This is by far the easiest reskinning process for a source code you will ever work on. Coming with the source code, the online course: (FREE with any license purchase). You get the 5-star rated Udemy online video course from Yohann Taieb, superstar app reskinning expert. All his online courses are 5-star rated, featured on Forbes, WIRED magazine, first-page of Reddit and so on. The courses are “idiot-proof”, meaning, someone who never even touched a MAC computer can publish his/her own game in the app stores, just by buying the source code and following the online course. Now you can do it the old fashion way and take the chance of failing, or you can get this bundle and simply succeed. The choice is yours.